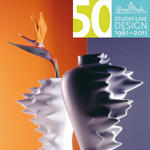 The Studio Line by Rosenthal celebrates its 50th birthday in 2011. In the event of the anniversary, Rosenthal presents the limited edition “50 years – 50 vases”. For this, 50 vases from famous artists and designers were selected that mirror the Studio Line versatility and innovation-force. The collection begins in 1961, with the Studio Line year of birth, with a vase by Tapio Wirkkala and ends in 2011 with a new design from Christophe de la Fontaine. Many of these objects are timeless classics that are still in the Studio Line collection today, such as for example the Fast Vase and the Surface Vase. Some pieces came out of the Rosenthal archives and are re-edited for the anniversary. Find the whole collection “50 years – 50 vases” from Rosenthal on the homepage of the company.